We've seen in our previous post that with the rise of smokeless powders replacing the old black gunpowder, steel barrels became more popular as these could withstand the higher pressures generated by smokeless powders. We will now study some of the processes involved in making a modern steel barrel. The first type is an Chrome-Molybdenum steel alloy (called chrome-moly for short). This is the same steel alloy that is used to make truck axles, connecting rods and propeller shafts. In the US, such steels are designated by grades such as AISI 4140, AISI 4150, AISI 4340 and so on. The British equivalent of these steels is EN 19, EN 24 etc. These steels are generally used for military grade firearms as well as hunting rifles. The other type is a stainless steel alloy such as 416 type stainless steel. This is not a true fully austenitic stainless steel such as the types used in making cutlery items like knives and forks. The 416 type stainless steel is a martensitic steel which can be hardened by heat treating, similar to carbon steel. It is more accurately a high chrome content (> 10%) steel having enough sulphur to give it good machining properties. This steel is generally used by target shooters and is considered to be easier to machine accurately than chrome-moly steels. It is also more expensive than chrome-moly steel, has lesser life and is more difficult to black. Hence, military and hunting rifles use chrome-moly steel while target shooters prefer stainless steel. Whatever the type of steel chosen, the most important characteristics of the steel are ease of machining, longevity and strength. Secondary considerations are resistance to corrosion and ability to be blued. It is important for these steels to have high tensile strength (i.e.) resistance to being pulled apart. These steels can easily withstand over 100,000 psi which is quite a bit over the maximum expected pressure. Hardening steels generally increases tensile strength, but it tends to make them brittle and susceptible to hard knocks, hence these steels must withstand shock as well. A tradeoff is made between tensile strength and impact strength and therefore, the barrels are hardened to between 25 and 32 on the Rockwell C hardness scale. The steel for the barrels is generally not made by the barrel makers themselves, but instead arrives from external vendors in lengths of 5 - 7.5 meter (16.5 - 24.5 feet) long cylindrical bars and diameter depending on the barrel makers specifications. For instance, barrels intended for hunting rifles have a diameter of 3.25 cm. (1.4 inches) and barrels for smaller .22 rifles may be 2.5 cm. (1 inch) in diameter. The external vendor generally stress-relieves the steel bars before delivery. This is done by heating the bars to 525 - 550 degrees centigrade (977 - 1022 degrees fahrenheit) and then allowing the bars to cool slowly. If the bars are not stress-relieved before hand, they may split during the machining process. 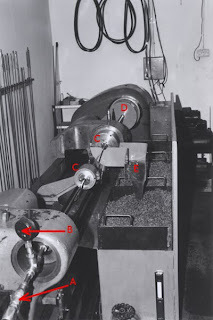 The first step of the process is to cut the bars to the required length of gun barrels (e.g. 16 inches, 18 inches, 20 inches, or for metric speakers, 450 mm. or 500 mm. or whatever) and the ends are squared off. Then a hole must be drilled into the barrel. Everyone knows how to drill a hole into a wooden plank or wall, using a small hand-drill or power drill. Some may have seen or handled a drill press in a machine shop and used it to drill into a mild steel plate. Drilling a hole into a gun (especially rifle barrels) is a completely different proposition than drilling a hole into a wooden plank or a mild-steel plate. For one, a rifle barrel is a lot longer and the drill needs to penetrate deep into the barrel. The second problem is accuracy. For a gun barrel, it is critical that the drill does not deviate much from the center of the barrel, and this has to be true for the entire length of the barrel, which may be 40-50 cm. long or more. This means the ratio of diameter to length of the hole is unusually high for gun barrels. For example, an M-16 rifle barrel has a diameter of 5.56 mm. and a length of 508 mm. (20 inches), which means the ratio of length to diameter of this barrel is approximately 91:1. The drill bit is made of tool steel or tungsten carbide (these days, tungsten carbide is more common). The diameter of the drill bit is slightly smaller than the required diameter of the barrel. For instance, if the barrel bore is 5.56 mm, the drill bit is designed drill a hole slightly smaller than this (say 5.35 - 5.40 mm.) Note that the drill bit is asymmetric (V-shaped) and only has a cutting edge on one side. The drill bit is also ground so that the forces acting on the cutting edge will keep the drill bit centered in the work piece automatically. The drill bit is also hollow, as can be seen by the two holes at the end of the drill bit. The drill bit is mounted to a steel tube and then oil is pumped under pressure through the drill bit holes. As the drill bit makes its way through the barrel, the oil serves to keep the drill bit cool. Also, the metal shavings are carried out of the barrel by the oil via the V-channel in the middle of the bit. The oil is then passed through a series of sieves to filter out the metal shavings and the oil is recycled into the main tank. In some other drill bits, there is a single hole in the middle. Oil is pumped through the V part and the oil and metal shavings exit through the hole in the drill bit. Now we look at the deep hole drilling machine that uses such a drill bit. In this machine, you can see a pressure gauge B at the bottom end of the photo. The oil is pumped through the pipe A into the drill bit. The barrel blank to be drilled is mounted to the chuck D on the top part of the photo. The drill passes through a couple of guide bushes (C) before entering the barrel. The guides may be seen in the middle of the photo. The barrel is usually initially pre-drilled to a few mm. depth before being mounted to this machine, to give the drill bit an initial starting hole. In most deep drilling machines, the drill bit is held steady and the barrel is rotated around it at speeds of 2000 - 5000 rpm. In some newer machines, the barrel is held steady and the drill bit is rotated. In some cases, both are rotated. 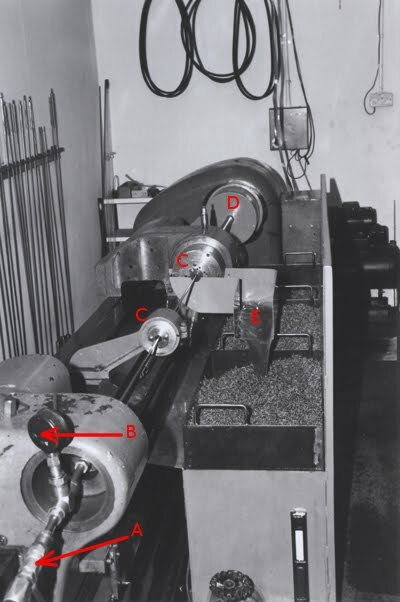 However, the technique of holding the drill bit steady and rotating the barrel is preferred because this method keeps the drill bit self-centered. Oil is pumped at high pressure from the end A seen at the bottom of the picture. You can see the dirty oil carrying metal shavings coming out of the channel E near one of the supporting guide bushes in the middle-right of the picture. This oil is passed through a series of filters to extract all the metal shavings and the oil is then recycled back into the main tank. The drill bit is fed into the barrel at a slow rate of approximately one inch (2.5 cm.) per minute, so a 20-inch M-16 rifle barrel will take approximately 20 minutes to drill completely. 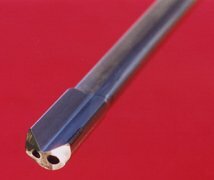 The drill bit is initially held in the straight position by the guide bushes and prevented from moving side to side, but as it penetrates deeper into the barrel, the sides of the hole itself prevent the bit from moving around too much. Variations in the consistency of the barrel material can also cause the drill bit to wander a little. The barrel must also be straightened (or trued) before being mounted on the deep drill, because the barrel is rotated at high speed during the drilling process and any imbalance in the shape of the barrel will be magnified when it is spinning at such high speeds. As we noted earlier, the drill bit is designed to cut a hole slightly smaller than the final diameter of the barrel. So if the desired final diameter is 5.56 mm., this process drills a hole that is 5.35 - 5.40 mm in diameter. The next process that we will study is used to enlarge the barrel to its final diameter. 1.what maximum pressure is creating in bore(using black powder)? 2.and how much temperature will create during the blast? what is the minimum bore diameter for hunting a bird or small objects? 1. Depends on various factors, such as grain size of the powder, burn rate of powder, chemical composition, amount of black powder used in the load, bullet weight, barrel length etc. As some of these factors depend on the brand of powder purchased, some reloading handbooks (such as "Lyman's Black Powder Handbook" list pressures generated by various popular brands of black powder for different loads. These numbers can vary widely depending on the type of powder. For instance, the handbook lists seven different pressure values from 13500 PSI to 23500 PSI for seven different powder brands, even though the same barrel and same weight of powder was used for all the tests. 2. Again, this also widely varies depending on burn rate, chemical composition, grain size etc. Smaller grain sizes burn faster in general. Some of them generate hot gases of temperatures around 1550-1850 degrees farenheit (about 850-1000 degrees centigrade) and I think the pyrodex type generates extra hot gases at something like 4000 degrees farenheit or so! 3. Most people use shotguns for birds. You might also want to read the Effectiveness of Cartridges series of articles on this website, dating from December 2012 and going into January 2013. If you look at the blog posts made during September, October and November 2014, you will see discussions about the different metals used in firearms, including various types of steels and the reasons for using them. Hope that helps you out in your presentation. I would really appreciate it if you where able to send me a link to one of those poasts. that would be really helpfull. Do you see the menu on the left of the screen under "Blog Archive". Simply click on "2014", then click on "September" and start reading from there.